Welcome to Paloma Beach Apartments in Los Cristianos, Tenerife. We provide quality, 3 Star Tourist Board Approved self catering Tenerife apartments at affordable prices - the perfect alternative to a hotel. The place to spend your holiday in Tenerife, soak up the sun and relax with family and friends. 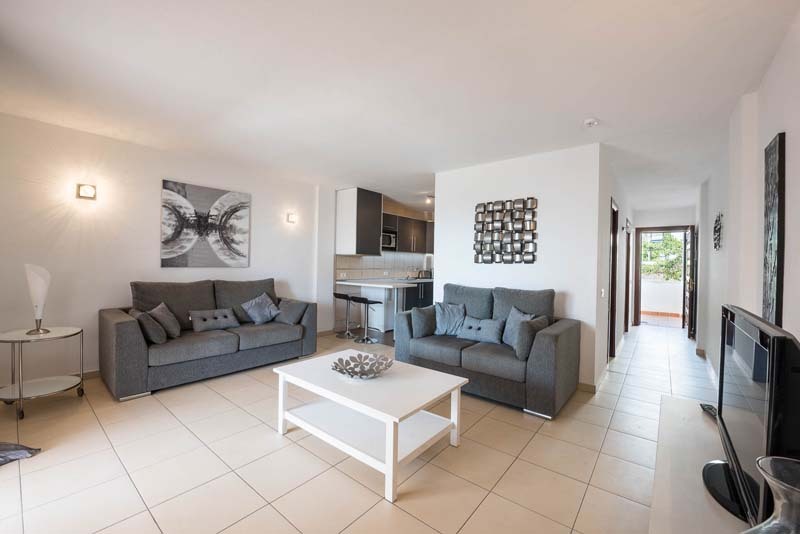 Paloma Beach Apartments are a beautiful development of holiday apartments in Tenerife, built to four levels and situated next to the headland in Los Cristianos. The apartments are spacious and well equipped and guests can choose between; Standard 1 Bedroom Apartments, Superior 1 Bedroom Apartments with Air Conditioning in the bedroom (our best apartments), and 1 Bedroom Penthouses. For larger parties there are 2 Bedroom Apartments & 2 Bedroom Penthouses. Because the apartments are self catering, you will enjoy more space, lower prices, and less intrusion compared to booking hotels in Los Cristianos. Our accommodation all have sea views or overlook the private heated swimming pool or exotic gardens. Our onsite reception is located poolside and is open 7 days a week ensuring guests find everything with ease and enjoy a relaxing holiday in Tenerife. Free Wi-Fi is available around the swimming pool and also in every apartment FREE OF CHARGE. We are proud to be the first and only licensed accommodation in Los Cristianos to provide free Wi-Fi in every unit. Paloma Beach Apartments are a pleasant few minutes stroll along the palm tree lined promenade to the town centre of Los Cristianos. Here you will find shops, bars, restaurants and evening entertainment. There are plenty of bars and restaurants nearby too, along with 2 well stocked supermarkets within 50m of the complex. Browse our web site to find out more about Paloma Beach Apartments, the town of Los Cristianos and the island of Tenerife. Look no further for Los Cristianos apartments - call us to book your holiday today on +34 922 750410. We are very proud of our reviews and every care is taken to ensure each customer leaves us wanting to come back and recommend us to their friends & family. You can read what our past customers think of Paloma Beach Apartments by reading our reviews from Tripadvisor. We are pleased to have received a Tripadavisor "Certificate of Excellence" several years on the run now. For your convenience we can arrange airport transfers from Reina Sofia (TFS) or Los Rodeos (TFN) to and from Paloma Beach Apartments making for a trouble free start to your holidays. Tenerife airport transfers available here. To book your holiday call us now on +34 922 750 410 or click here to check availability & book online.